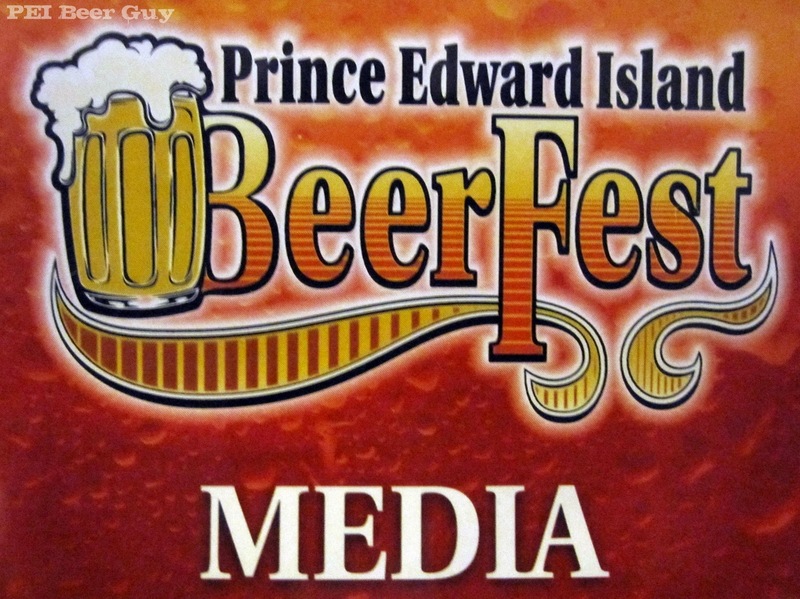 Well, I returned home a few hours ago from the first session of PEI's first-ever beer festival. I wasn't sure what to expect in terms of set-up and attendance, as the organizers were rookies at this, too. On their side, though, was a keenness to do it right and to listen to and learn from those attending. So... how was it? I arrived only fifteen minutes early, and had two options: I could vote in the wrong riding of an advance poll, or I could wait in line for the beer fest. I chose the latter, and was Guest #1. Waiting for me was a fancy shmancy media pass, helping to make me look all official-like.There was a healthy line-up looking to get in, and I thought that the crowd was pretty decent. For the afternoon session of our first beer fest, where there was almost only beers available at the liquor store, the crowd was pretty good. It was a mix of old and young, and everyone seemed to be in a jovial, relaxed mood. I was happily surprised at how "smart" the crowd was overall. The mass-market companies didn't have many visitors to their booths, especially compared to a few others. I'd be curious to hear how they did at the night session. People, in general, flocked to, and waited for, beers from our local breweries, and returned for their different varieties. 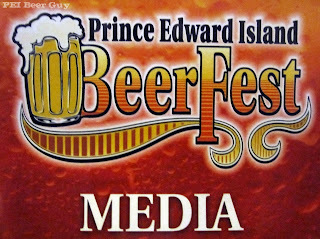 The most popular brewers would have to be PEI's new Barnone, Picaroon's, and perhaps Garrison or the table with Pump House and a few others. I think Picaroon's had the steadiest line-up the whole time, but that was partly due to the fact there was only one person there opening and pouring bottles - who just happened to be their owner/brewer Sean Dunbar. 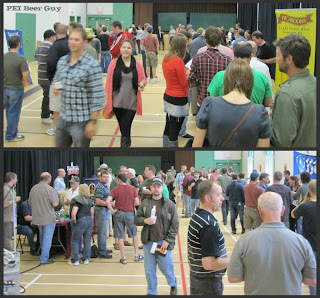 I'm not sure how many in attendance knew about their recent wins at the Canadian Brewery Awards this month (including brewery of the year), but that definitely couldn't have hurt. I was a little surprised at the relatively little attention Garrison seemed to get in comparison, as I think their reputation among beer folk is generally better. The fact there were two servers there didn't hurt, in terms of moving people along, though. In terms of the beer, I had one main focus: Barnone. I had sampled every other beer there before except for a couple of Molson / Labatt's products, and I wasn't about to fill up on those. As soon as I went in, I went to Barnone, and started my sampling. I'll save my pics of the beer and notes for a later post, but I can honestly say their three beers were the best of the fest. Their Summer Sessions, Pale Ale and IPA were the best beers available. The fact that they were probably the freshest beers there, and the only ones on tap, and not out of a can or bottle didn't hurt. My other general thoughts on the beer was that Picaroon's tasted OK, but that I'd liked what I'd had of theirs more in the past. Known to have some diacetyl (some say "issues", others would say "character"), I found the couple I sampled to be a bit more buttery than in the past. Dunbar said he likes beer making to be a bit "dirty" and has diacetyl in there on purpose to mix things up a bit. Garrison was fine, although I found their Hop Yard to be not as good as I have had in the past - same goes for the Oktoberfest, which I quite enjoyed last year. I tried a couple of other things around the fest - two I'd had before, one I hadn't, and that was that. I just returned to Barnone a couple of times - not so much as to deplete their stock (they were a bit worried about running out of one or more beers before the second sessions would be over) - but enough to keep me in good beer & happy. the few munchies were OK, but some plain crackers or some such thing (to help reset the ol' taste buds) would have been nice. Those peppery Triscuits kind of messed me up for a beer or two. A food vendor or two wouldn't be out of line... maybe soft pretzels or something similar. have some water available for folks to hydrate / reset their taste buds - even if it's just bottled stuff for sale. maybe look into getting labeled souvenir tasting mugs that people could use - it reduces waste, and gives someone something to take home. I thought some of my cups had a bit of a plastic smell. Water stations may be needed to do some mug rinsing between tastings, though. a place or two to dump some suds if you got something you didn't like. the venue was decent - downtown, bathrooms right off the main room, etc. Something more upscale would be nice, though, too. How about the Rodd Charlottetown's ballroom? Or one of the rooms at the Delta? Overall, cheers to Campbell Webster Entertainment for kicking this event off. I get the impression from them that they are keen to keep their eyes and ears open for ways to improve and make things even better for next year. This was one small step for some beer drinkers, and perhaps the (co-?) beginning of one giant leap for the Island beer scene. "Dunbar said he likes beer making to be a bit "dirty" and has diacetyl in there on purpose to mix things up a bit." You have got to be kidding me?!?!? Diacetyl from his so-called "dirty" sources are disgusting and a reflection of his poor brewing & sanitation practices. What a shockingly dumb thing to do & say. Thanks! I'd like to take credit for the pic, but it's a stock one. I have a similar, paler one from the D.V. triple I had several months ago... I may try it out some day. Thanks for stopping by & commenting. Cheers! Agreed about Picaroons... their beers pretty much always taste buttery. I keep mentioning this to people around Fredericton, but no one else seems to really notice. I think it's partially due to their use of Ringwood yeast, and partially b/c of their fast turnover (check their brewing logs... it's usually about 6-7 days from grain to glass). I didn't know they used Ringwood... makes sense, though. In retrospect, some of Granite's brews have a similar "tinge" but not nearly so strong.